It looks like a lot of steps, but since the scale of the quilt is small, the process moves along quickly. The finished size of the quilt is 13” x 25”. Once you can do a quilt like this, you can use the knowledge to work on bigger projects. This tutorial is written assuming that you already know how to operate your sewing machine, but everything else is pretty basic. 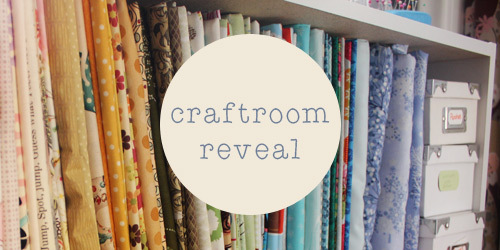 You should be able to follow along if you are a complete newbie to quilting. If you do have any questions during the process, feel free to leave me a comment here and I will get back to you as soon as I can. While you can cut out your fabrics with regular scissors, I truly recommend investing in a self-healing cutting board/mat, rotary cutter, and acrylic ruler. 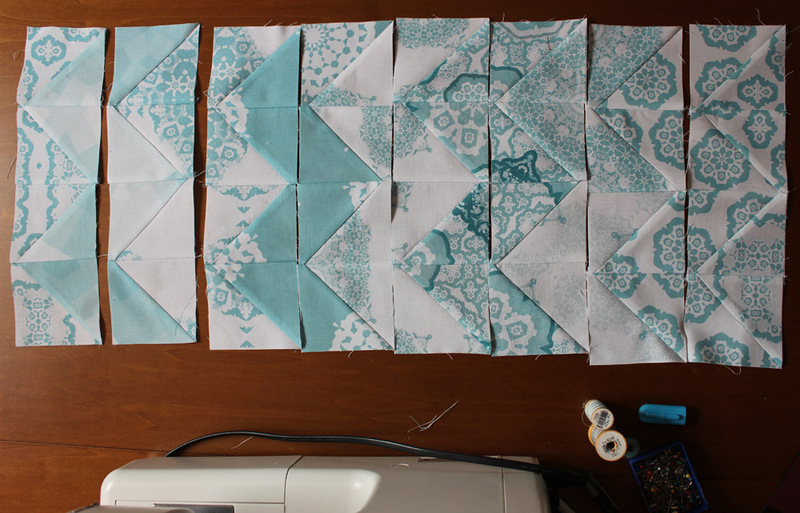 Quilting can be an exercise in frustration if your fabrics don’t line up perfectly. 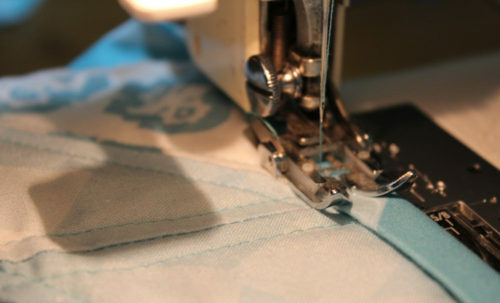 A good rotary cutter will help create precise cuts, and combining those precise cuts with perfect ¼” seam allowances creates quilts with corners that line up nicely. In Ontario, Canada, Fabricland is a great source for these and they go on sale for 50% off often. You’ll need 8 prints to create the chevron design. If you don’t have 8 coordinating prints, you could also do 4 prints and use each one twice, or do a traditional chevron pattern with only two prints. Fold your fabric in half with the selvages together. 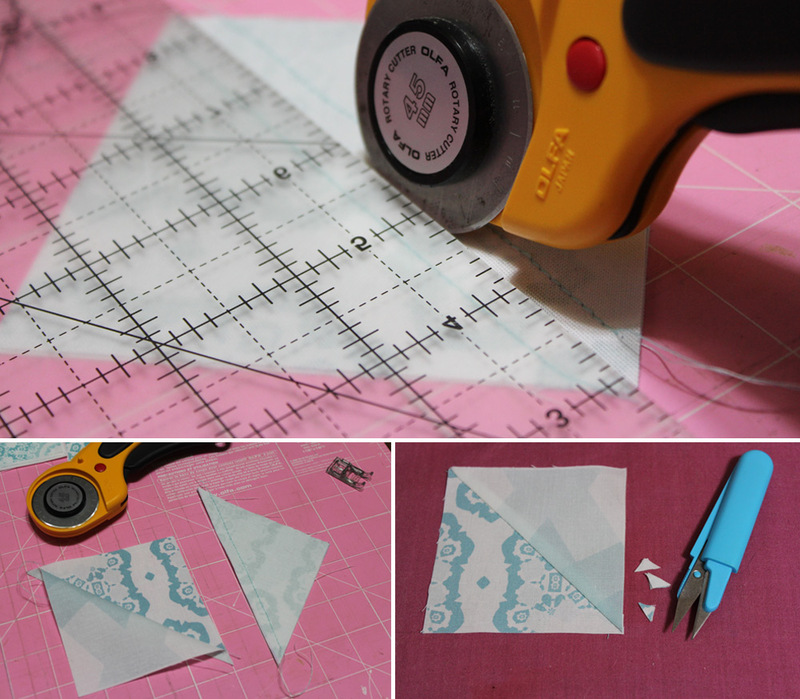 Making sure your fabric is squared up to the lines on your cutting mat, use your rotary cutter and ruler to cut a fresh edge. Move your ruler over 4 inches, then do a second cut. You’ll now have a strip of 4” wide by 44” (approx). From this strip, make four cuts 4” inches apart. You’ll now have 4 squares plus some extra to use for another project. 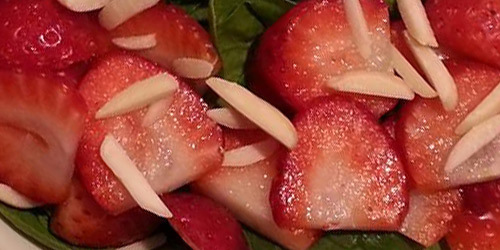 Simply cut it in half crosswise twice with your rotary cutter to create 4 squares. Cut out a 15” x 27” rectangle from the batting. It can be a bit larger if you wish, no need to be exact. I always make sure my batting is at least 1” larger on each side to account for slight shifting while quilting. Cut out a 15” x 27” rectangle for the batting. Similar to the batting, I always cut this out a bit larger than the front so no matter what the fabric will reach the edge and be caught by the quilt binding. Fold your fabric in half, selvages together. 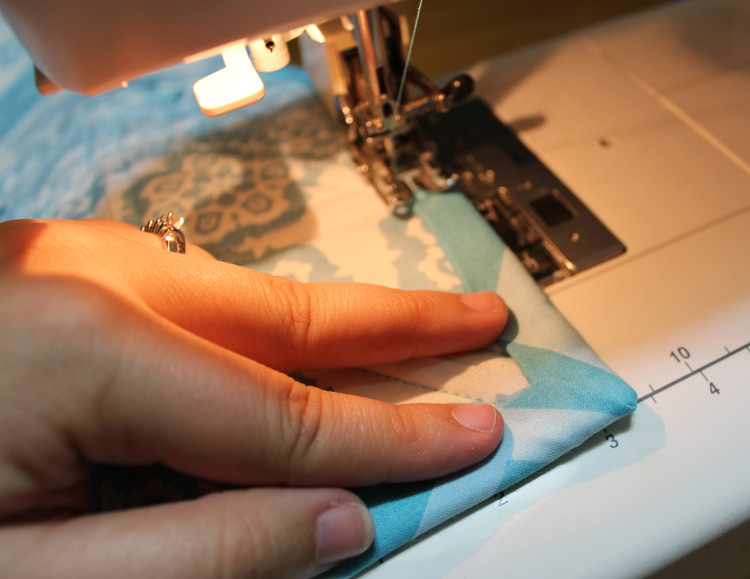 Making sure your fabric is squared up with the lines of your cutting mat, use your rotary cutter and ruler to cut a fresh, clean edge. Move your ruler over 2.5 inches, then do a second cut. Move your ruler over again 2.5” inches and do a third cut. You’ll now have a two strips of 2.5”” wide by 44” (approx) fabric. Here is a diagram for how to assemble the chevrons. It may look complicated at first glance, but you just need to think about its parts at a smaller level. This quilt consists of 8 rows. Each row consists of 4 Half Square Triangle (HST) units. 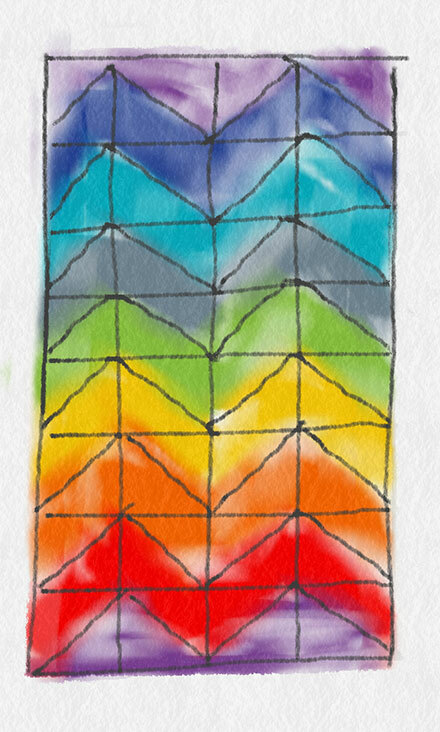 I’ve used a rainbow colour palette on the diagram to differentiate between each print and numbers 1 through 8. When assembling each of the HSTs, you’ll need to ensure you put the right prints together in order to create the pattern. 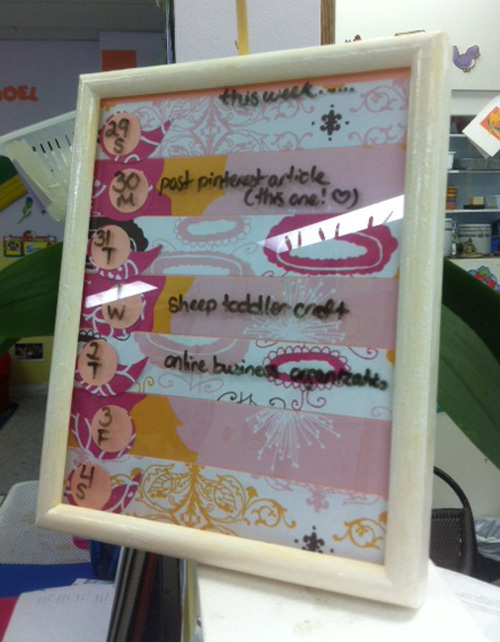 For example, you’ll need to create 4 units with print #8 and print #1 together. You’ll need to create another 4 units with print #1 and print #2 together. And so on, and so on. 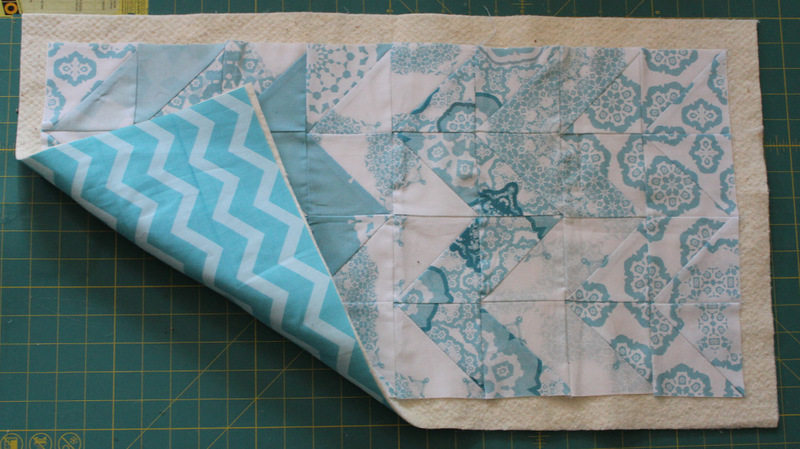 Take two of your 4×4” fabric squares and stack them print sides together. Reference the diagram to ensure you have the correct prints together. Line up your ruler from one point to the opposite point, forming two right-angled triangles. Mark this with a disappearing ink fabric marker.If you don’t have a disappearing ink marker, you can use a regular pencil or pen, but note that it may not wash out. 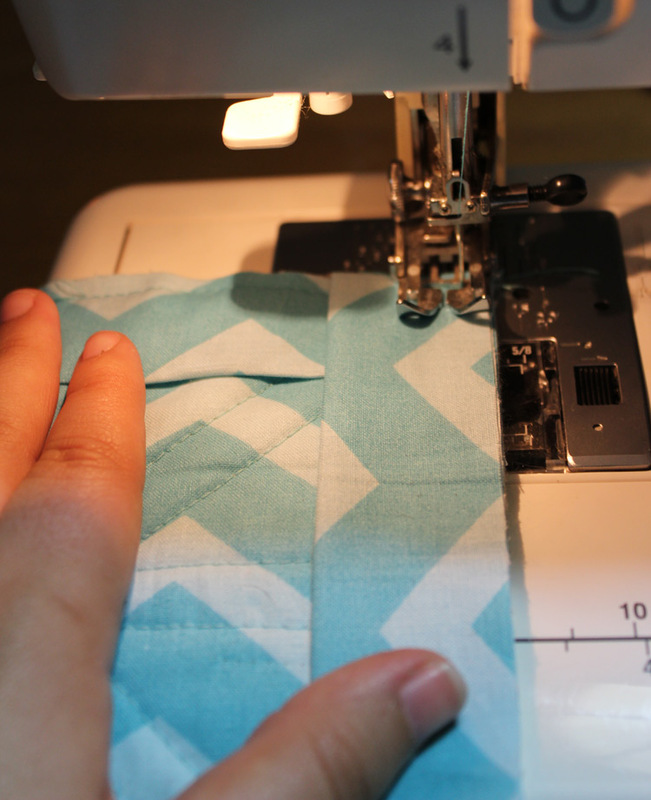 If you have one, put a ¼” seam foot on your sewing machine and sew two seams, one on each side of the marked line. 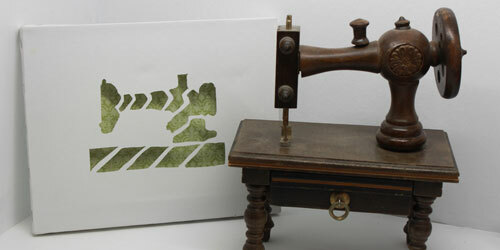 Take the unit back to the cutting mat and carefully slice along the marked line. You’ll now have two HST units. 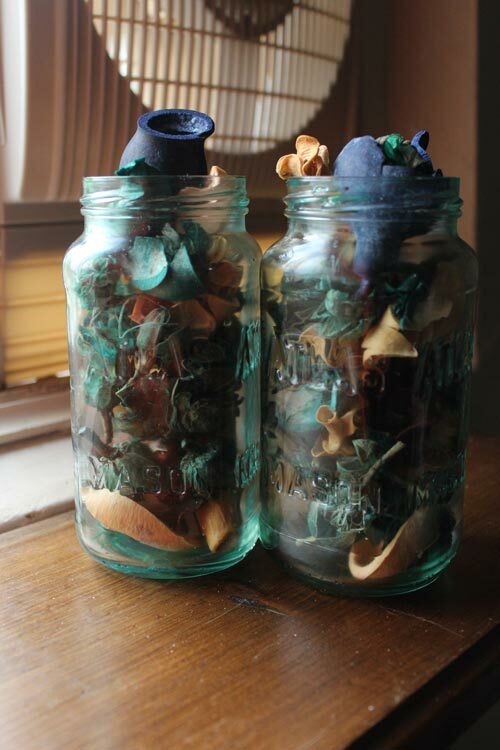 Press them with an iron and snip off the little triangles sticking out from the seams and any hanging threads. When pressing, you have the choice of opening the seams flat or pressing the seams toward one side. I like to press towards the darker fabric, but the choice is yours. I find it’s the most efficient to stack and mark all the squares as a batch, then sew them all as a batch, then cut all the marked squares as a batch, then trim them all as a batch. Please note that if you are using a disappearing ink pen that you should sew the seams as soon as possible. I’ve done the ink in the evening and gone back to my sewing machine the next morning to find that the ink had already evaporated. My pens say their ink disappears after 48 hours, but I haven’t found that this is actually the case. Once you have the units prepared, it’s time to assemble them. Referencing your diagram, you’ll want to create each of your rows. Clear a surface and arrange the HST units into the correct design. Use a ¼” seam allowance to sew the HSTs to each other. 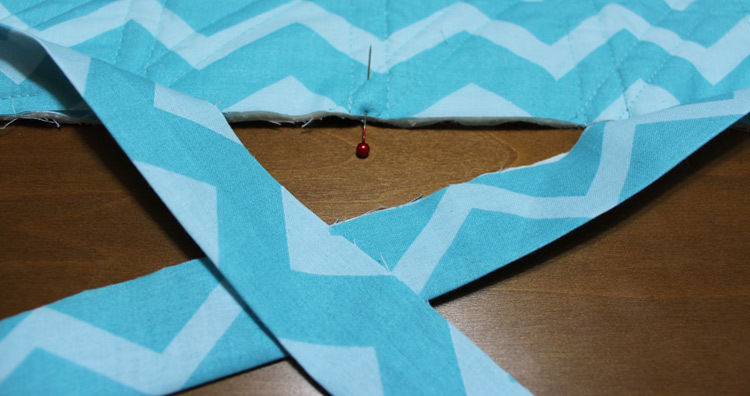 Double check that you have them oriented the right way before sewing so don’t have a wonky chevron. Note: it’s worth it to bring out your iron to press all your HST units. This helps line them all up for perfect points. Sew together four HST units to create a row. Repeat for all 8 rows then press your seams. 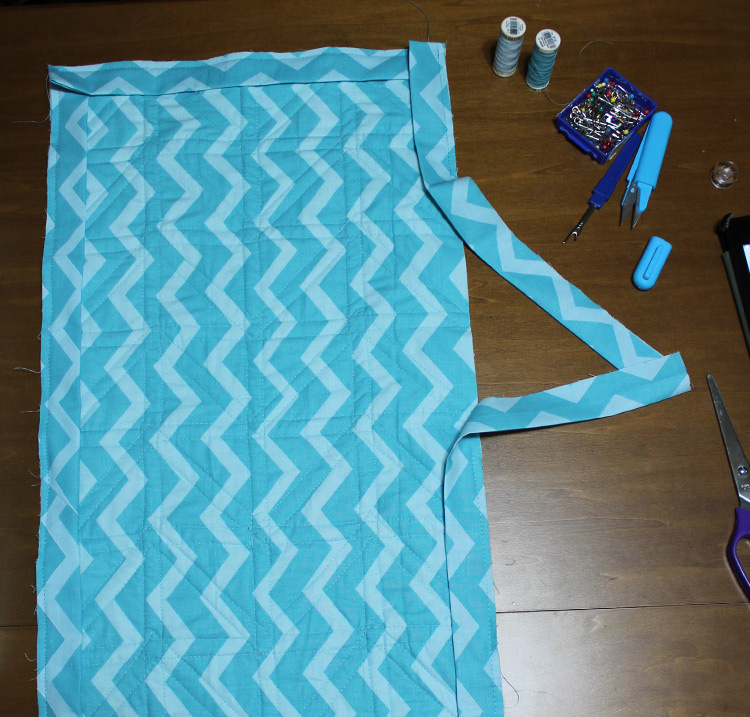 Arrange your 8 rows on a flat surface to double-check that the chevron pattern is correct. Carefully line up row 1 and row 2, pinning them right sides together. Be sure to line up your points; I suggest pinning directly where the points meet for the greatest chance of success. Use a ¼” seam allowance. Repeat for the remaining rows. It’s beautiful, isn’t it? 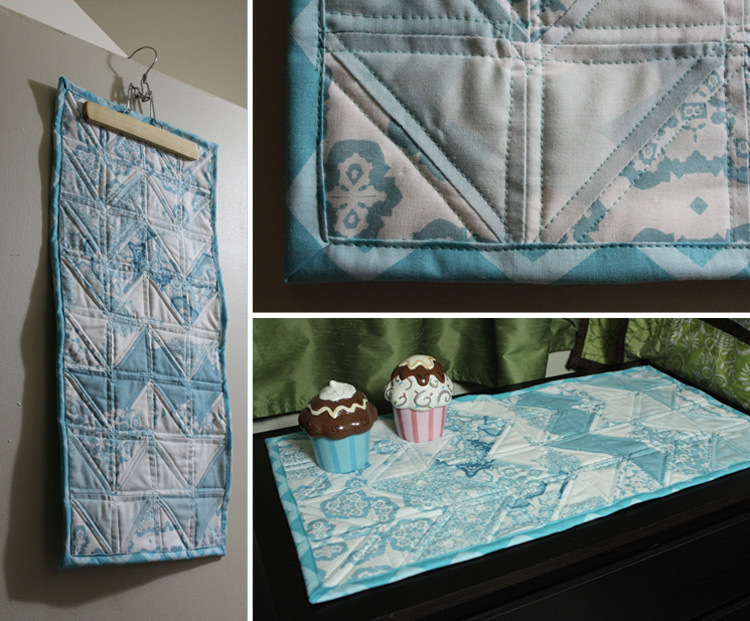 Admire your handy work for a minute, breathe, and let’s turn this quilt top into an actual quilt! 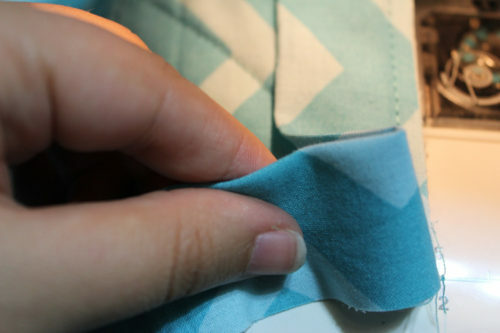 Place your backing fabric wrong side up on a flat surface. If this were a larger project, you might want to use masking tape to adhere it to the surface. Place your quilt batting on top. Make sure it’s smooth (no wrinkles!). Centre your quilt top right side up on top of the batting, making sure to line everything is lining up square. This is especially important if your backing fabric has a clear vertical or horizontal pattern since you don’t want the backing to appear crooked. Again, make sure it’s smoothly placed. 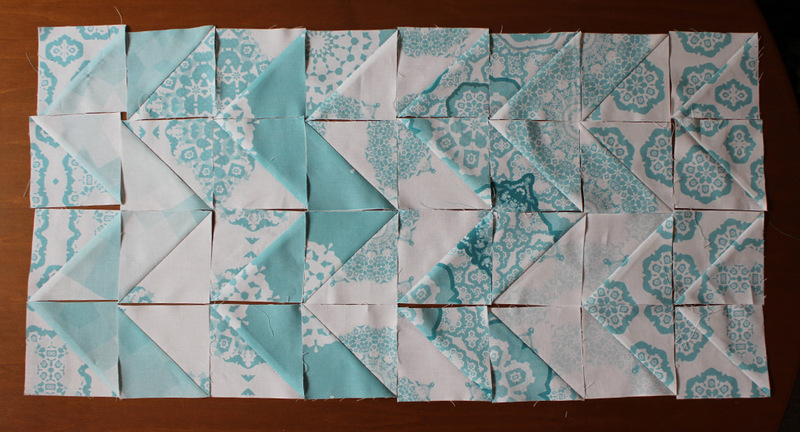 Your quilt batting and backing should stick out evenly on all sides. 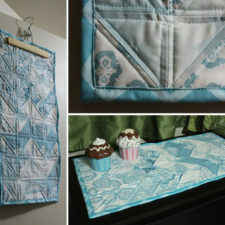 Take some safety pins and pin through all three layers all over the quilt. I don’t necessarily pin every unit. For units of this size, pinning every other unit should be fine. When you’re done pinning, check both sides to ensure that you didn’t get any inadvertent wrinkling. If you have a walking foot attachment for your machine, attach it to your machine now. This attachment helps keep all your layers moving together. 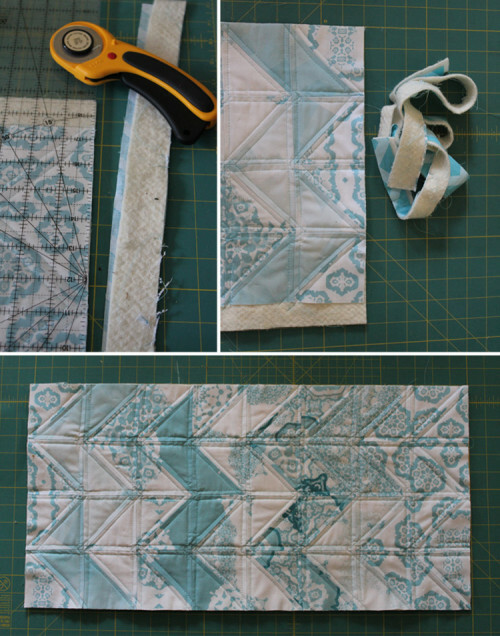 To quilt, all you need to do is sew a design over your quilt to make sure all your layers are attached together. You can do this in a simple way or you can make complex designs. The fastest option is to stitch in the ditch. Simply stitch over all your seams, being careful to remove any safety pins that could get in your way as you go. Try your best not to stray from the seams. At minimum, you’ll want to stitch over all vertical and horizontal seams, but for best results, you can do those lines first, then follow along the chevron diagonal seams in a zig zag fashion. This is the method I used in this project. Instead of sewing on top of the lines, you stitch a certain distance from the seams, echoing the shapes. 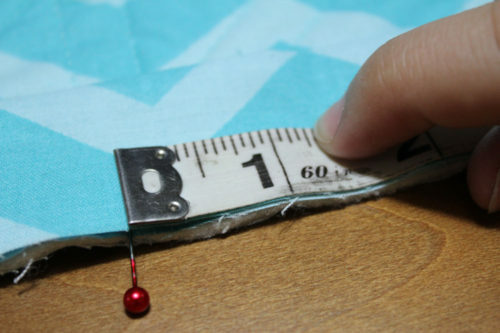 My quilting is approximately ¼ inch from the seams. I like this method because it really emphasizes the shapes of the design, especially when the fabrics are in a similar colour pattern like this one. This method will take at least twice as long as stitch in the ditch since at minimum, you’ll need two lines of stitching to follow each seam. For increased effect, you can echo the lines more than once. 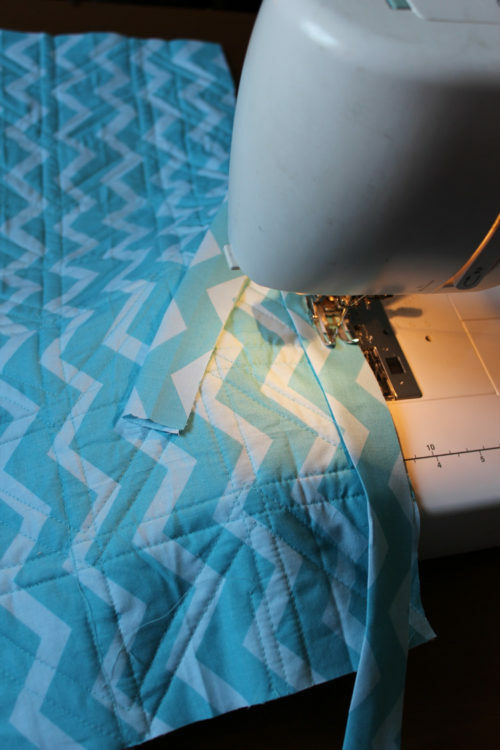 Rather than following the seams, you can do all-over stitch lines (vertical or horizontal) across the entire quilt an equal distance from each other. You can either mark your lines with a disappearing fabric marker, tape, or simply use the edge of your sewing foot to move a certain distance from the previous quilt line. You can do an all-over design over the whole quilt. I don’t have any experience with this method yet. You can see many examples on Pinterest. 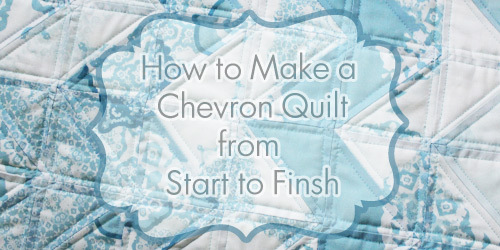 If you end up doing the echo style of quilting, the easiest method of following the chevron design is to sew along the edge, ¼” from the seams, towards an intersection. When you reach the seam line, stop sewing with your needle in the down position. Lift your presser foot, then rotate your quilt and realign your presser foot to ensure you will still be a ¼” from the next seam. Repeat until you finish the zig zags. Once you’ve quilted over the surface, you can remove all the safety pins. Now it’s time to trim your layers and make sure everything is nice and square. 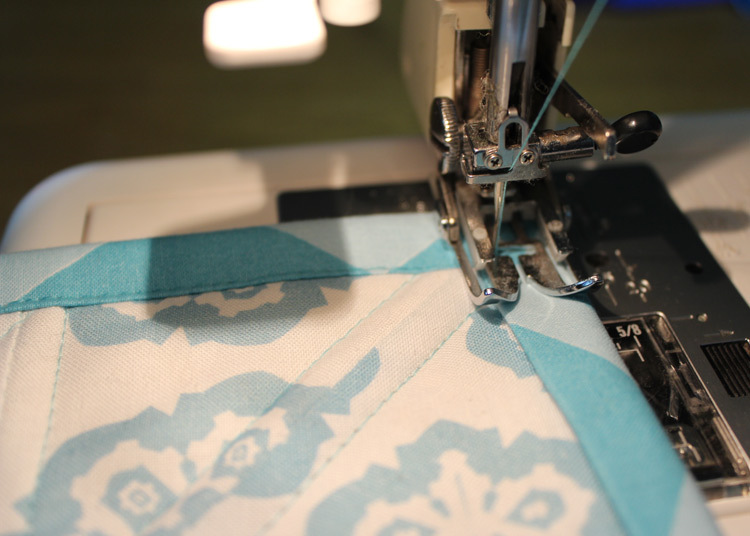 Using the acrylic ruler, mat, and rotary cutter, trim one edge of the quilt. Rotate the quilt on the mat, making sure the trimmed edge is aligned with the ruler on your mat. Align your ruler perpendicular to the trimmed edge, then cut. Repeat for the remaining two edges. When you are done, place the quilt on the mat to ensure that everything lines up with the ruler lines. Each corner should line up at a 90 degree angle. To create the binding for the quilt edges, you’ll need to take your two fabric strips and sew them together to make one continuous length. Don’t simply sew them together horizontally because this will create extra bulk in your binding. You can sew them together diagonally instead. 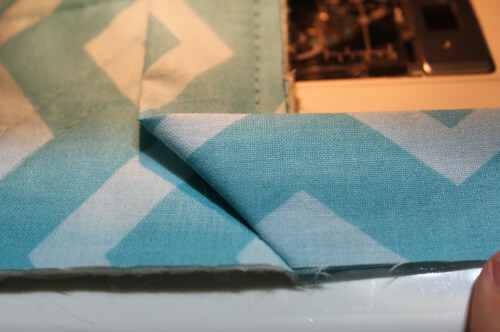 Line up your fabrics right sides together as shown below, then sew diagonally as indicated. Press the seams open then trim off the excess leaving approximately ¼” inch. 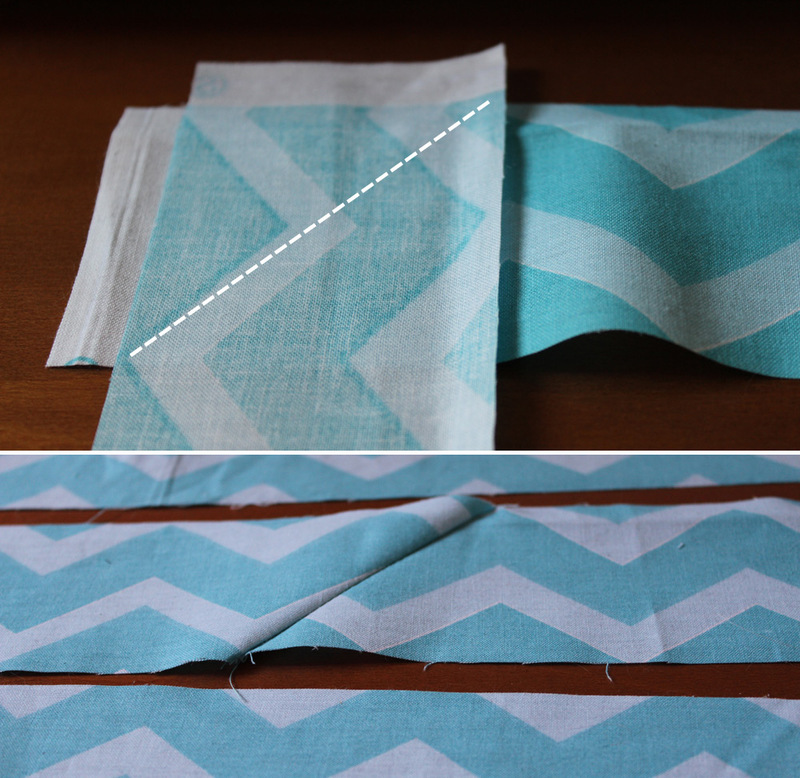 Now that you have one long strip, you’ll want to fold the fabric in half lengthwise. Press with an iron to keep the binding crisp. Place your quilt sandwich wrong side up. 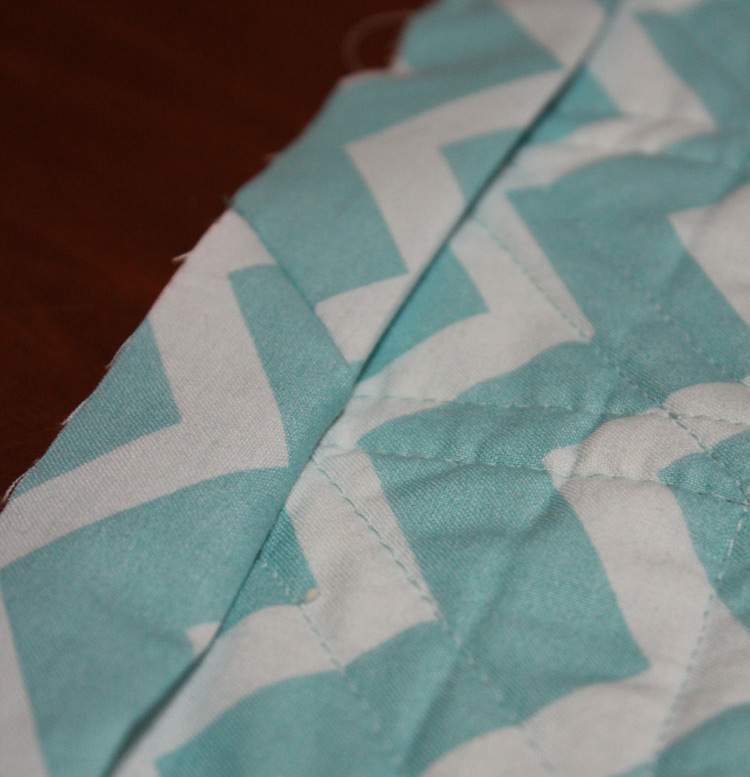 Starting at the middle of the right edge, line up the binding with raw edges towards the outside of the quilt. Make sure to leave a tail of approximately 8 or so inches. The longer the tail, the easier joining will be later. You can pin if you wish, but I don’t bother. Just carefully sew along the edge of the quilt with a ¼” seam allowance ensuring your binding doesn’t stray from the edge. 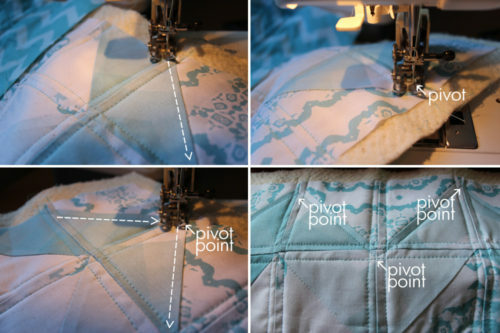 Sew until you reach ¼” from the corner of the quilt, then put your needle in the down position, lift the presser foot, and rotate the quilt to a 45 degree angle. Sew until you meet the corner of the quilt as pictured below. Take your quilt off the machine. It’s time to make the mitered corner! It’s easier than you think. 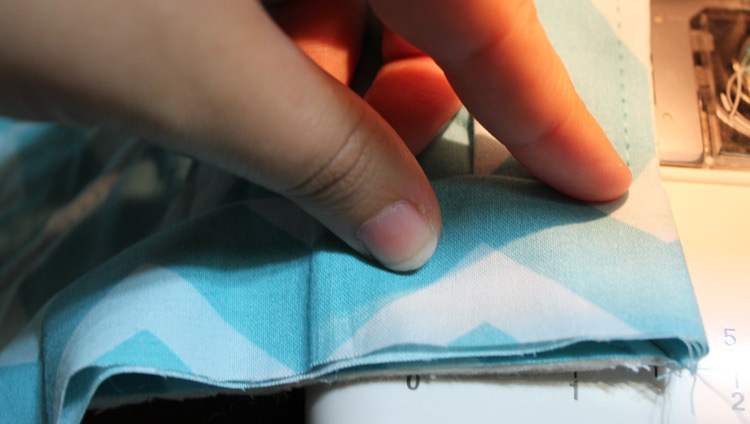 First, move your binding towards the right, making sure that you fingerpress the binding into a 45 degree angle. You can follow the stitch line you did into the corner of the quilt as a guideline. Making sure that this 45 degree angle stays in place, bring the binding back across to the left, lining up the binding in two places: the right-most edge of the binding should be perfectly lined up with the right edge of the quilt sandwich, and the bottom edge of the binding should perfectly line up with the bottom of the quilt sandwich. 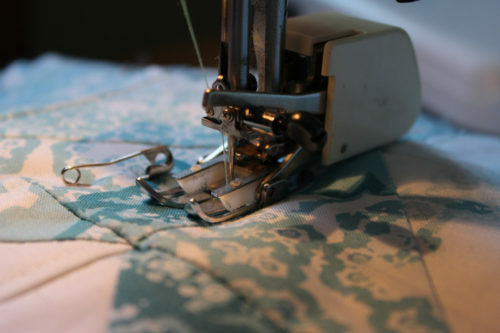 Put your quilt back under your presser foot in the direction of the next length of binding that you are attaching, and carefully put your needle into the fabric, ¼” from both edges of the corner. Imagine that you are putting it into the position where you left off before sewing diagonally into the corner. 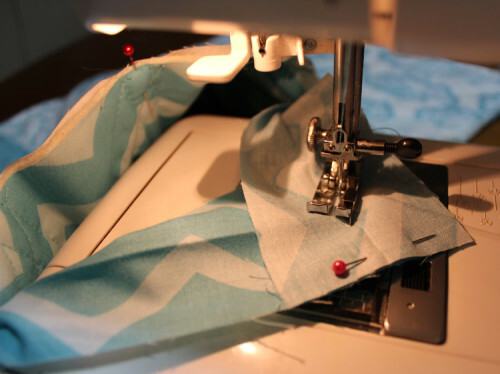 Continue sewing until you reach the next corner, and repeat. When you reach the side you started on, stop sewing when you are approximately 8” from where you started, and again, leave a tail. I learned this method from Heirloom Creations’ fabulous Youtube video: “Quilt Binding Connecting the Ends.” Seriously, this method called Edna’s Binding is the easiest method I’ve tried. I recommend watching the video to complement this tutorial because it is fabulous, clear, and easy to follow. Keep in mind that our quilt binding is 2.5”, not 2.25”, so our measurements are slightly different than the video. Use a pin to mark the halfway point between where the two ends are attached. Bring one of your binding tails all the way across the edge of the quilt. Measure and mark 1.25” (half the width of our binding strip) past the halfway point indicator. Snip along this line. Bring the other binding tail across in the opposite direction, and again, measure and mark 1.25” past the halfway point indicator. Snip along this line. Discard the unused pieces. Similar to how we originally joined our original two strips, we are going to join the pieces diagonally with the right sides together. Open up the binding strip tails, and while slightly bunching up your quilt, bring the two binding pieces together right sides together and sew diagonally. Snip off the excess fabric leaving approximately ¼”. Refold the binding and fingerpress the binding into position. If you’ve done it successfully, you shouldn’t be able to tell this join from any other binding joins. Fantastic! Starting in the middle of one of sides, bring the binding from the back of the quilt towards the front. I moved my needle position to the far left and lined up my presser foot with the edge of the quilt. 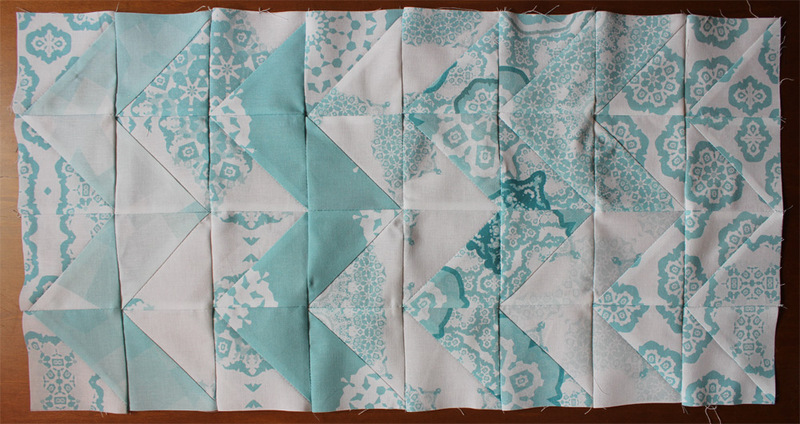 Start sewing down the sides of the quilt, ensuring that the width of the binding is equal all the way down. You can pin if you’d like, but I don’t bother. 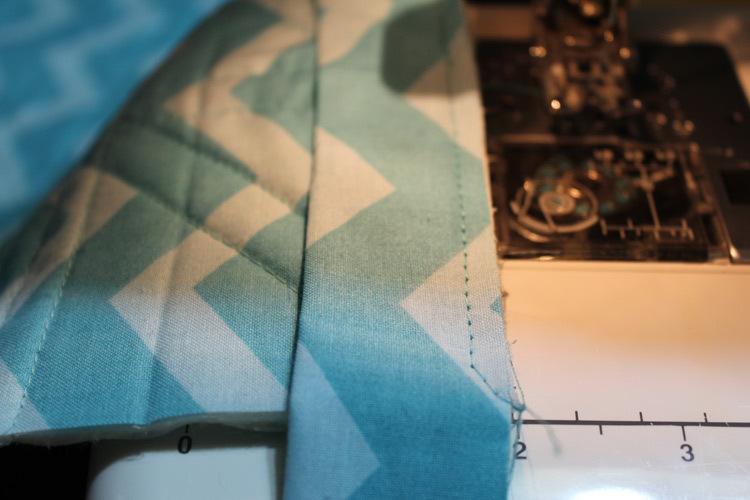 When you are approximately 3 inches from the corner, carefully align the fabric in the corner so it forms a ¼” seam line. Continue sewing and when you reach the corner point where your needle is going through all layers of the binding, make sure your needle is in the down position, lift your presser foot, and rotate your quilt. Sew and repeat. Your mini quilt is now complete! If you have any questions or feedback regarding these instructions, please feel free to leave me a comment below. 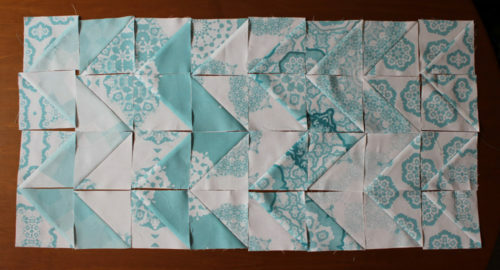 If this tutorial inspires even one person to try their hand at quilting, I will be extremely happy. I’d love to see links to your projects, so please let me know if you give this tutorial a try! Happy quilting!